P.L. Johnson & Solon Rummage, Cleveland, OH. 26" x 30" engine, Cuyahoga Iron Works, Cleveland. 8' x 17' firebox boiler, 90 psi. steam. 1875, May 30 Sea trials with 200 guests aboard, to leave Jun 1 for Detroit River. 1881, Jan Owned Groch & Mackey, Cleveland, OH to tow barges in Saginaw trade. 1882 - 83 Enrolled Sandusky. 1883 May have been in Duluth for season. 1884, Jan Owned Hebard & Thurber, Pequaming, MI. 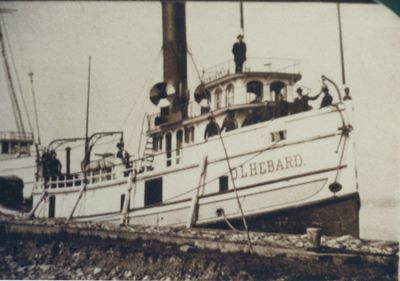 1884, Jun 2 Renamed DANIEL L. HEBARD; used in log & barge towing. 1893, Sep 27 Arrived Duluth, MN for repairs in drydock. 1925 Owned Ford Motor Co.
1931 Broken up; engine to Greenfield Museum.